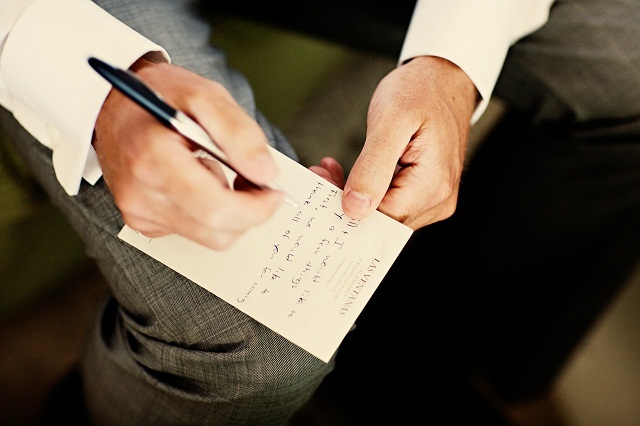 Writing your own vows can add a personal, unique touch to your ceremony. Of course this is a task that can seem so daunting but really, once you know where to start, can be easy! First of all, look to the traditional…I take…to have… for as long as we both shall live… it’s all fairly simple but a fantastic place to start! If you don’t fancy using the traditional wording that’s fine, but the structure is an excellent place to begin. The rhythm and the length alone is something to be guided by, you’ll feel more relaxed using something so familiar, just fill in the gaps! Take inspiration! This one is simple: poems, literature, films and songs, we are surrounded by creative inspiration and words of love every day, go ahead and use it! Remembering you have an audience is key, and one full of dear family and friends so if you’re one to blush easy, consider how gushing you want your vows to be! Of course this is your wedding and love is the theme, but consider your wording and how your audience might feel if you start revealing you deepest feelings, it’s never good to embarrass your guests by going OTT! Finally, speak to your partner before you start writing. You are both going to be feeling as nervous as each other about writing your vows so best to have a chat and decide on the tone of your vows together. Speaking about it together will be a lovely process, it will ensure you mirror each other on the general tone and feel of the vows and will put you both at ease. And always remember, this is a process you should enjoy so there’s no need to panic! Posted in Planning TipsTagged Writing your own vowsBookmark the permalink.